The Agilent 3325A Synthesizer / Function Generator is a versatile and precision synthesizer providing frequencies from 1µHz to 21MHz (sine), 11MHz (square), and 11kHz (triangle, ramps). The 3325A is an excellent choice for ATE Systems as its completely HP-IB programmable! 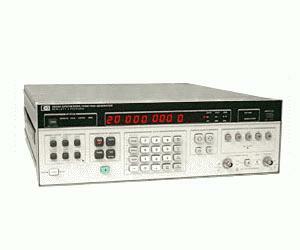 The Agilent 3325A includes a log/linear sweep function with variable sweep time and marker out, external AM and phase modulation, and variable phase offset when connected to another Agilent 3325A.